JAPAN is a country with a very rich CULTURAL HERITAGE. It fascinates people all over the world with its traditions and also sets global trends in contemporary culture. But very few people actually know much about Japan and its heritage and many of these wonderful products are very hard to find outside of Japan. Our mission at NIHON ICHIBAN is to make traditional and modern JAPANESE LIFESTYLE more accessible to the rest of the WORLD. We created multiple sites to support our mission. All sites and the shop are under the management of Chinriu Honten Limited, a traditional Japanese food company founded in 1871. I made a web site that gives person kanji name. For the past years, Live Lingua have been working with educational institutions and other Japanese training centers (online and offline) to provide free Japanese Lessons. 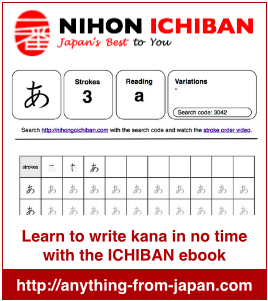 The link: http://www.livelingua.com/fsi-japanese-course.php, is a dedicated page containing a vast repository of complimentary “How To Speak Japanese” training lessons in eBooks, audios and video formats. Aside from this we have other free lessons on the site that are 100% free to use and with no commercials or ads. If you thing that your teachers, staff or students would find this material useful please feel free to share it with them. It is 100% free. We are hoping that people would get to appreciate the Japanese Language by being able to appreciate it for free online. If you need anything else please don’t hesitate to contact me. I am managing a language exchange SNS. I found this web site, I become a favorite of it. There are many informative content in this page! I think that I recommend this site for my users. Because many users are studying Japanese. My SNS can speak Japanese with native japanese by Skype or text chat. I wish that you come to my SNS. Thank you! Search service is very bad. I’m very impressed by Your site. It is obvious that a lot of work has been done, but the website is still in developing, what is sad. I’m going to study in Japan, so I started to refresh my knowledge of the Japanese language. I was searching for materials or sites on the Internet, and then I’ve found Your website. It’s very lovely and convenient. Also, it for free. I’m just a student, but still I want to send You some money as gratitude for Your hardwork and to contribute to the early filling sections of the site. Please, send me some of your data of paying system or something like that which I can use for making a remittance. I hope, the money at least will recoup some food for programmers, heh. I think the visitors of your site may be interested in my Japanese phonetic converter. Unlike other converters that just add furigana to Japanese text, my converter also displays the pitch accent in Japanese words. I would really appreciate if you could post the above link on your site.